In the summer green houses become very hot houses so people put fans in them. Many of the large commercial green houses have netting to add shade or pull down the clear cover and put up a sun block cover. I needed to add a fan so I set about some research on the subject. There are a number of nice fans you can get from green house supply stores but I did not like the cost of what I needed. Then it came to me; in the past I have installed attic fans and it looked as if the ones they were selling were the same basically as the hardware store had. Well it turns out the fan is basically the same but also had a temperature control switch on it producing an additional savings. To figure out what size wire you need to run look at the amps you may draw then use the formula to of amps to the distance the wire must run from the source. Wire is like a resistor and you have voltage drop over distance and this can burn out motors. 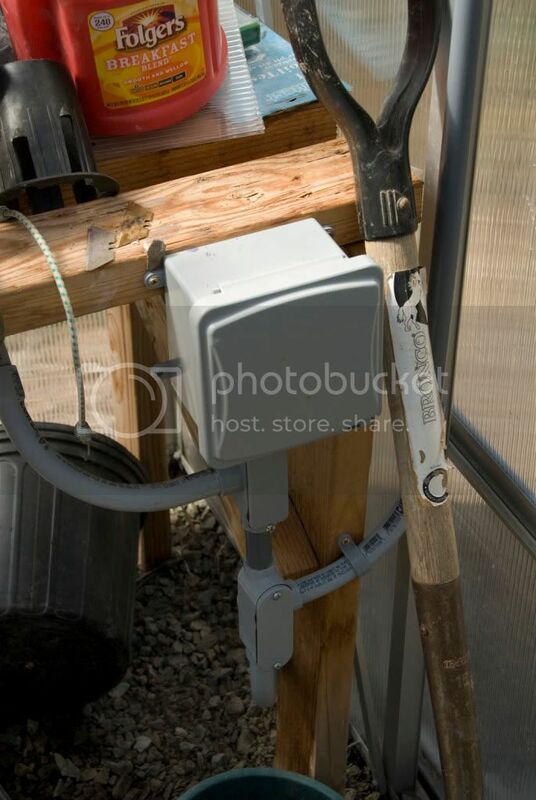 I had power not to far from the green house and it was on a GFI, you want all out door power on GFIÃ¢â‚¬â„¢s. So I dug a ditch from the power to the green house and ran plastic conduit to the green house. Plastic is water tight, easy to work with and does not rust. Inside the green house I ran more conduit giving my self a fan, a plug and a light. I used a tube cutter to cut the conduit evenly but you can use a saw. Glue in place and make sure you have junctions that you can work the wire to, ones that you can open to get at the wire. You will need a wirepuller to pull the wire through the conduit. After the wire is pulled use a wire stripper so as not to cut into the copper wire making it break and strip a bit less than Ã‚Â½ inch off the wire. If your green house is a long ways from power and it is not practical to run power than your alternative is to go through a green house supply store and get a solar powered unit. 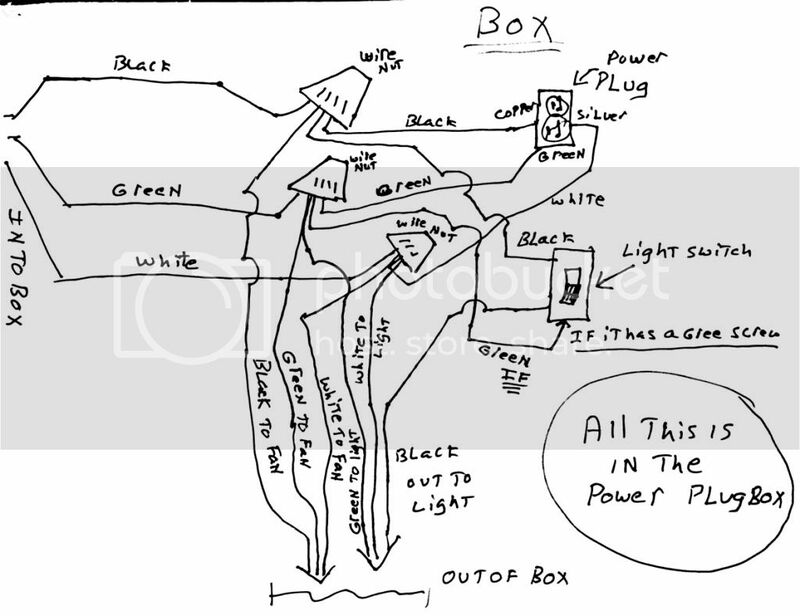 When wiring remember to shut off the power to the circuit you are hooking up to! Most wire you get in single strands for conduit has a water resistant coating on it; make sure it will have TNNW or such on it. If you run out door in ground cable it must be a bout 2 feet deep to protect it. If you run conduit and get wire cut get the same length of black white and green wire. The white is the neutral and the green is the ground. The black is the hot wire it will connect to the copper screws on plugs and the small side of the plug (one in the same) the white goes to the silver screw and large side of plugs, and the green goes to the green screw this is the plugs ground, this is for a power plug in the green house. On the fan there will be a black and white wire and there will be a green screw in the box just hook up the colors, use wire nuts and tape them in place. I used 2x4Ã¢â‚¬â„¢s to create a stand for the fan, use whatever works. You need an out side vent to cover it; the kind that has shutters is best. When you have the fan in place trace the line of the vent cover over the location you need to place it and cut it out with a utility knife. Then just secure it to the green house. I also added vents for air to be drawn in another place on the green house. When you are all wired up turn on the power and use a screwdriver to adjust the temperature control, you may have to play with this when it is hot. Wiring in the plug box. The plug bos. Note the cover on it. 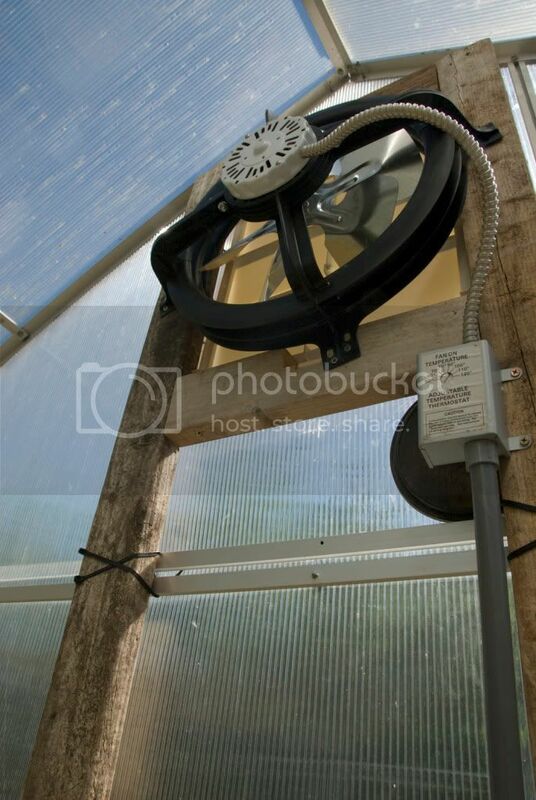 A view of the fan in the greenhouse. Due to the possible dangers involved in electricity this is only a suggested method and I take no responsibility for any liability. Follow the instructions at your own risk and you are responsible for dealing with codes, permits and inspections. Nice looking exhaust fan but what about HAF fans inside the GH? Tell me more. With most of use having small greenhouses, where and how do you recommend Horizontal Air Flow Fans? I've read a recommendation of 2CFM for every square foot of ground area? Orientation of 10 to 15 degrees toward the center and 2-3ft above the plants? or do you like the Poly tube method? 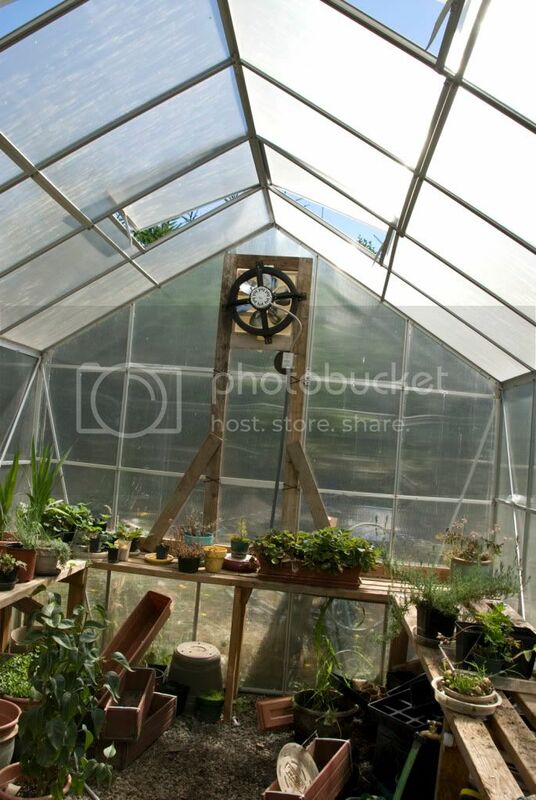 I have a plugin and just put a small fan inside the green house. My greenhouse is not small by the standards of this forum but I use roughly one HAF fan per 200Ã‚Â²ft of growing area. Mine are clamped to the ceiling of each zone and face in alternating directions by row to create a circular air movement. Rather than focusing on exactly what size of fan or it's exact placement I think I would rather stress the importance of having some type of fan to promote air movement within GH. Even a mall fan or a fan with less-than-ideal placement is better than no fan at all. This helps reduce disease problems and lowers the incidence of hot-spots that dry out unevenly compared to the rest of the benches. You got me thinking Ryan maybe I will hand some Haf fans, this would be better than a small house fan.